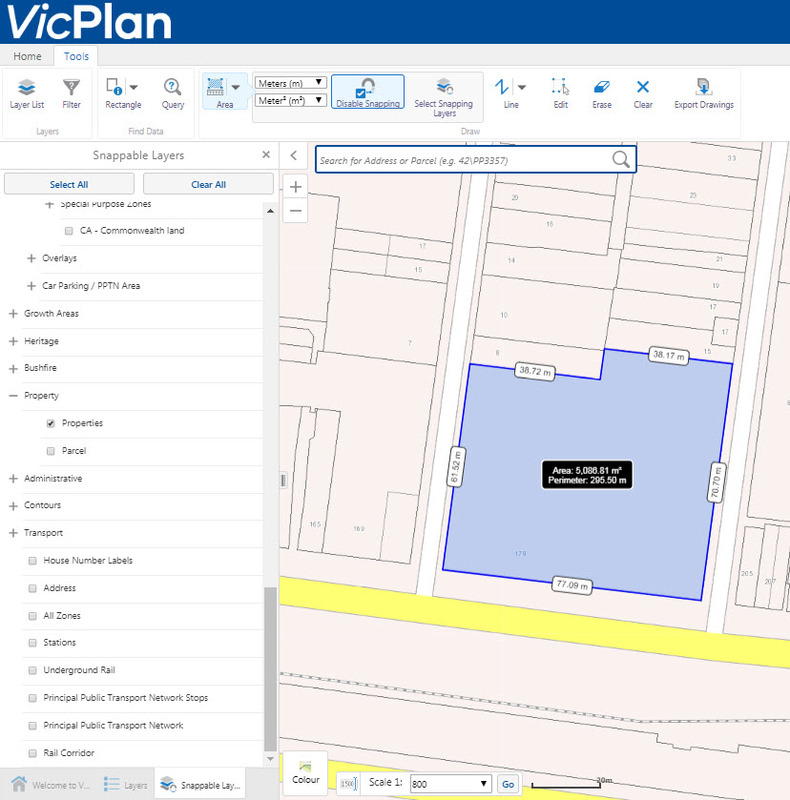 VicPlan map viewer allows you to find a property or parcel anywhere in Victoria, access links to all applicable planning rules, and generate a planning property report. 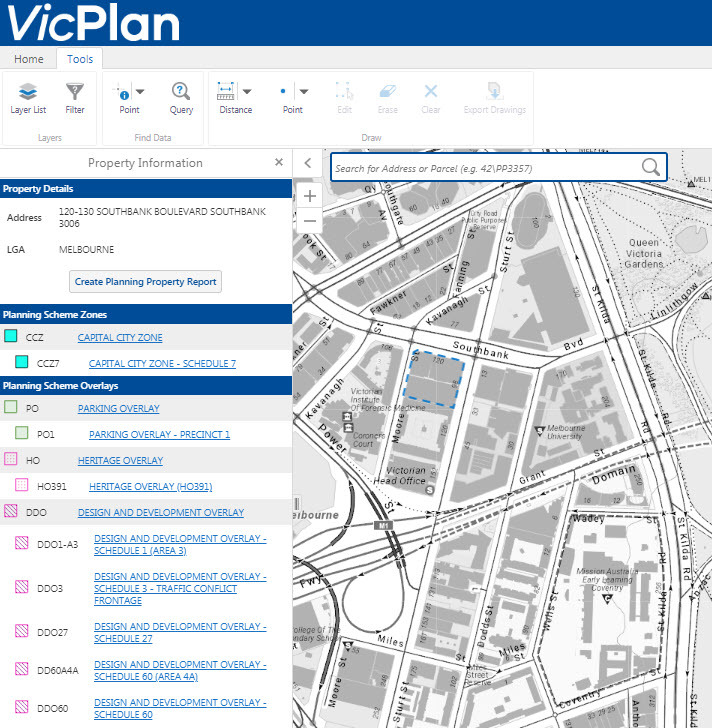 Watch the VicPlan introductory video below for a guided tour of the viewer and its functionality. How do I access VicPlan? 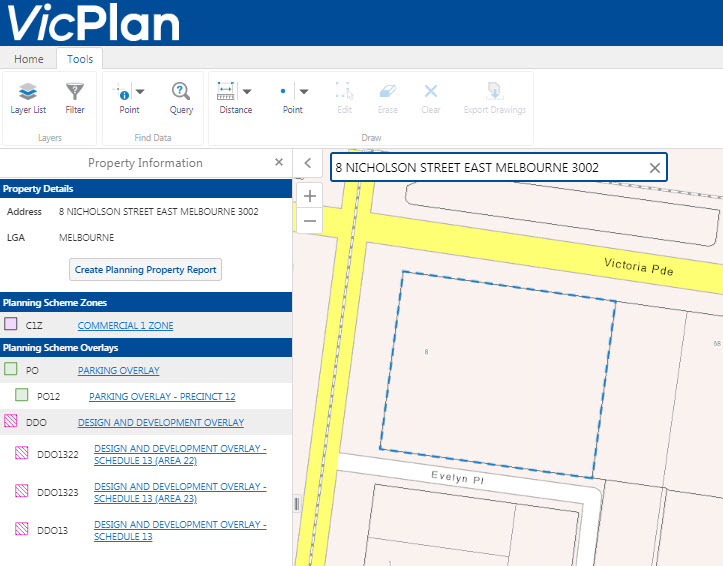 Access VicPlan directly, or via the Planning Schemes Online website. How do I find a property or parcel? If you know the address or parcel number, type it into the search bar. You can also start by searching for a locality or local government area. If you don’t know any of these details, browse the map by clicking and dragging the map to a location. You can double-click on the map to zoom or use the plus and minus buttons in the top-left to zoom in and out. Point and click at a location to see a list of property and parcel options in the left-hand panel. What is the difference between a property and a parcel? A parcel an individual piece of land that can be sold separately, and is also known as a lot. It usually has one proprietor or owner. A property is land, typically identified by a street address or a rate assessment number, that is under common occupation for the purpose of rating, billing or habitation. A property can be made up of one parcel or contain many parcels, or be one part of a parcel or parcels. How do the predictive search results work? Only the top five predictive searches are shown, and they are displayed alphabetically. If the address you are looking for isn't listed, keep typing and it should appear as the options narrow. Can I search by locality? Yes, you can search for a suburb or local government area. Once the area is displayed, you may need to zoom to view zones and overlays, which are visible at a scale of 1:25,0000 or lower. How do I see zones and overlays? Zones and overlays are only visible at a scale view of 1:25,000 or lower. Zoom in to see them. How do I view individual zones and overlays? Each planning zone and overlay shown on the screen can be selected by clicking the 'Layer list' in the toolbar or the 'Layers' tab in the Property Information Panel, you can select individual Planning Scheme Zones, Planning Scheme Overlays, Local Government Area Layer, Properties Layer or the base map to personalise the layers that you wish to see on the map. If you are unable to find the zone or overlay you wish to turn on or off, use the 'Filter' search bar in the 'Layer list' to change the colour transparency. The toolbar buttons and 'Layer list' will update the zones and overlays for the entire state. This means that the selection control applies to the whole state, not to only what you see on the map to allow a user to zoom in and out with the zone and overlays selected. Remember: that the zones or overlays do not default back to the original view once you have made your selection. You must reselect any of the individual layers that have been turned off to return to the original default view. How can I tell what the zone and overlay codes on the map refer to? 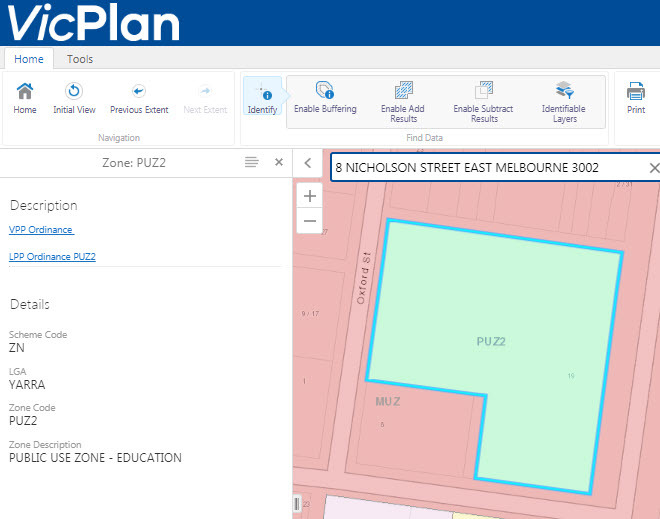 Every planning scheme zone and overlay control has a unique code that is a combination of colour, text and numbers. When an address search is performed, the Property Information panel will populate with the Planning Scheme Zone or Overlay, its colour on the map, the zone code and its corresponding ordinance documentation. For more information about zone and overlay codes, visit the Planning Schemes Online help section. What base maps are available? 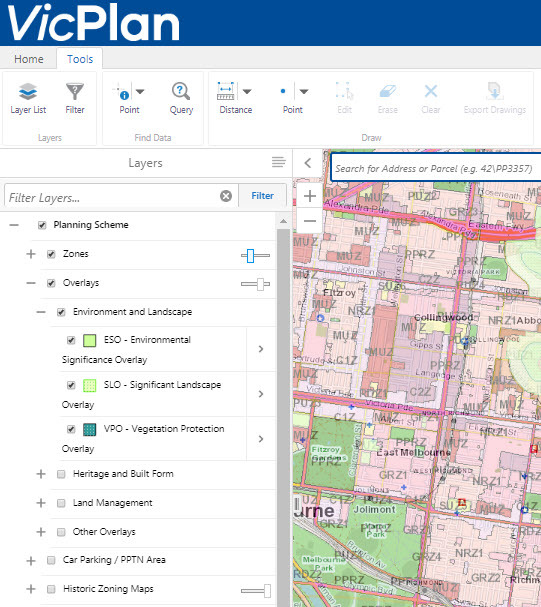 VicPlan uses four types of base maps, which you can select from the 'Map' icon or from the 'Layer list'. These can be used interchangeably depending on what you would like to view on the map. Greyscale - this is a Mapscape base map designed to provide more opportunity for better zone or overlay comparison to the base map. This base is available up to a 1:5,000 scale. Aerial - this shows the map with satellite imagery. Allows you to see different landscapes on the map e.g. vegetation. Hybrid - this allows you to view map and aerial imagery at the same time. Select Hybrid and Aerial in the 'Layer list' to view Hybrid. Can I change the colour of the base map? Yes, to allow greater visibility of zone and overlay colours, the base map can be viewed in greyscale. Transparency sliders are also available to weaken or strengthen the colours. How do I select a property/parcel? You can only click on a location when zones and overlays are visible – at a scale of 1:25,000 or lower. Point your cursor to the site and click once to bring up property and parcel options in the left-hand panel. Once you have selected a property or parcel, links to all the relevant sections of the local planning scheme for each zone and overlay will appear in the Property/Parcel Information Panel. How do I get a property or parcel report? A property or parcel planning report provides you with all the zone and overlay information for the selected property, along with a series of maps and links to the relevant sections of the local planning scheme, in a downloadable file. When you have selected a property or parcel, at the bottom of the Property/Parcel Information Panel you will see the ‘Create Property/Parcel Planning Report’ button. Click this button to generate your report. What does the identify button do? The ‘Identify’ icon provides more information about a selected property or location. This includes the zones, overlay or LGA layer. The Property Information Panel will provide a selection based on what information is within the point selected. 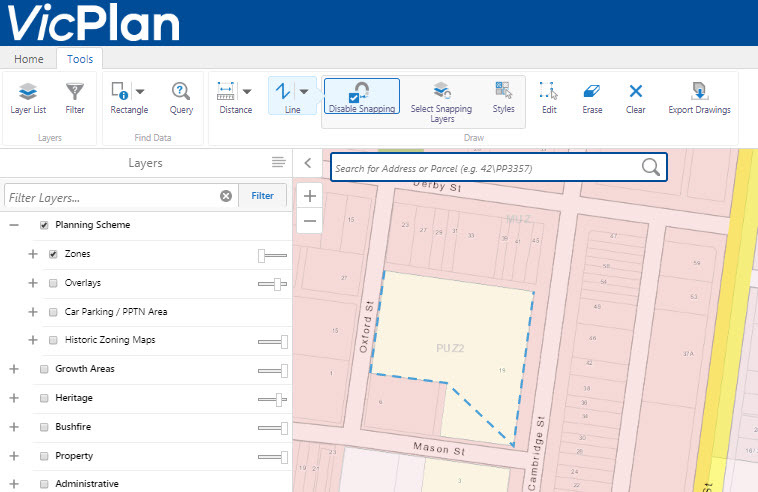 It is also possible to right click on a location from within the map to ‘Find data on the map’ to retrieve similar data and also retrieve the latitude and longitude coordinate. How do I use the mark up tools? The mark-up tools are great to use for placing marks or text on to the map for emphasis. These tools allow highlighting and drawing on the map. These can be edited and cleared from the map as you use them. There are many different shapes, colours and text that can be used to place mark-ups on to your map. These can also be printed using the ‘Export Map’ function in the ‘Basic Tools’ tab or exported into a Shapefile using the ‘Export Drawings’ icon. Remember: If you wish to use a different function in the other tabs, re-click the button of the feature you are using to return to a zoom and pan mode. How do I use the measure tools? Measure tools allow you to measure distances between points or determine the area for a certain location. By enabling snapping during the use of these functions, you can snap the line you draw to a layer that you choose so you can be more accurate with your drawing and measuring. You can also print out the measurement drawn on the map by using the ‘Export Map’ function in the basic tools tab. This function allows you to produce an image or PDF file of what is visible on your map and download it. After selecting ‘Print’ and reviewing the options available, click ‘Print’ to generate a file. You can change what part of the map is included in the file by unticking the ‘Lock print preview with map’ option and adjusting the map by panning and zooming to the desired area. How up-to-date is zone and overlay information? Zone and overlays spatial map data is updated weekly, generally on Thursday. Where can I view historical planning scheme information? Historic information is available on the Planning Schemes Online website. My screen froze, can I click refresh to keep working? On occasion some large map views can freeze when they are being generated. You may need to refresh your browser to fix the freeze, but refreshing the page will start the process over.